Home » Posts » Blogs » ICLs – Stable enough to survive a ping pong ball! ICLs – Stable enough to survive a ping pong ball! The first Intraocular Contact Lens (ICL) was implanted in 1993. It is the world’s fastest growing surgical procedure for vision correction, with one Visian ICL being implanted every 6 minutes around the world. Over 700,000 procedures have now been performed worldwide. AVC is one of the leading providers of ICL in UK, implanting the highest numbers per year. At Advanced Vision Care (AVC), our surgeons are pioneers and international trainers for Visian ICL. We were the first clinic in the UK to implant the hyperopic toric ICL (long sight with astigmatism) for a doctor. Mr Raithatha, a 23 year old male, working in accountancy enquired about refractive surgery was recommended AVC by his Optometrist. On consultation it became apparent he was unsuitable for laser eye treatment, because his myopia (short-sightedness) was too strong, but was an ideal candidate for ICLs. Surgery was performed on the right eye on the 17th January 2017 and the left eye on the following day. The procedure was without complication and his eyes recovered well. At a follow up in April his vision was 6/5 in each eye. Late at night, around midnight on Thursday 11th June Dr Pillai received a phone call from Mr Raithatha. He had been hit in the left eye by a ping pong ball whilst playing table tennis. Mr Raithatha was advised to go to Moorfields eye casualty department to have his eye assessed for traumatic injury. They ruled out any serious injury from the blunt trauma but the force had dislodged his ICL. The patient was amazingly still seeing 6/5 out of this eye and had no discomfort. Blunt trauma normally causes a number of injuries/inflammation to various structures in the eye or causing a rise in intraocular pressure. Fortunately in this case only the ICL was dislodged. As Moorfield’s consultant did not have much expertise in ICL and they contacted AVC to take over the management of this unusual condition. AVC arranged for Mr Raithatha to have his ICL repositioned. This was carried out easily by our surgeon and the eye was back to normal again. Mr Raithatha continues to see better than 20/20. The incident was a traumatic and distressing experience. However Dr Pillai gave me confidence and reassurance that once the ICL was back in place I would be perfectly fine. He was right. This is why all patients that undergo surgery with AVC are given an emergency contact number which means they will always have access to Mr Pillai should there be any unforeseen incidents like this one. This is just part of the first class care that AVC has become renowned for. Visian ICLs are FDA approved and have been used in the US military for over 10 years. The military studies proved ICLs to be safe and effective. They also found 98% of patients reported that they had better vision post-operatively than pre-operatively with glasses and 75% of patients said they had better postoperative vision than compared with pre-operatively with contact lenses. The other significance of studying ICLs in people of this profession is the dangerous environment they can be exposed to. McCauley and colleagues evaluated the impact of a grenade explosion. A 31 year old male active duty infantry soldier was serving in a combat zone in Baghdad, Iraq when a grenade detonated approximately 5 feet away from him. This occurred on the 28th June 2006 and the man had undergone bilateral Visian ICL implantation 8 months prior. The man was not thrown from the blast; he did not lose consciousness and did not have an acute decrease in vision. He was wearing full battle gear which includes standard issue, ballistic-tested sunglasses. The patient’s fist assessment in the hospital showed him to have 20/20 near vision in both eyes. The intraocular pressure was normal in both eyes, the pupils were reacting normally and the muscle movement range was full. There was bruising and swelling around the right eye and the lower eye lid. 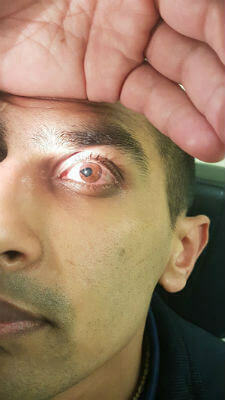 There was a subconjunctival haemorrhage and a CT scan showed two foreign bodies to the external eye. There were no foreign bodies intraocularly. The corneas were clear, the anterior chamber was quiet and deep and the ICL’s were well centred in both eyes. 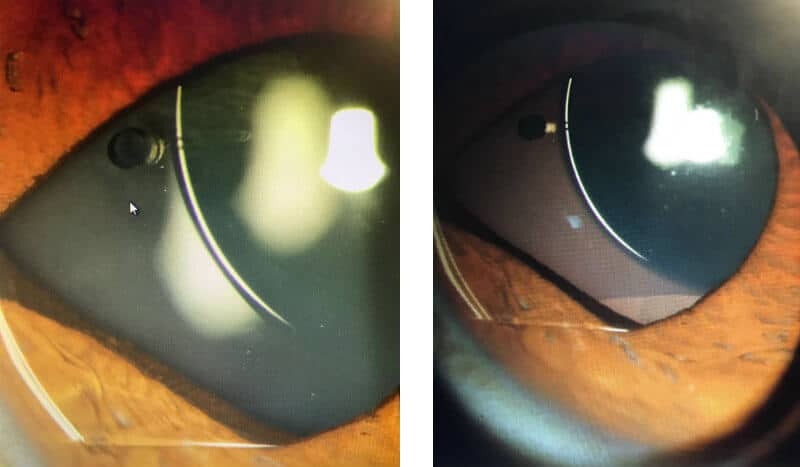 The left lens had a slight anterior capsular cataract in the superonasal quadrant which had been noted prior to the ICL surgery. The posterior eye showed a small area of vitreous haemorrhage adjacent to an area of subretinal haemorrhage inferotemporally in the right eye. These posterior segment findings are indicative of trauma to the globe whether it is direct or indirect. Regardless of these injuries the ICLs were completely stable. They were well centred with the correct amount of vaulting and there was no evidence of new lens opacities. It is acknowledged the force from the blast would have been reduced by the eye protection worn by the soldier; nevertheless it strongly supports the safety of ICLs even in perilous environments. If you would like to find out more about ICLa at Advanced Vision Care, then why not call AVC TODAY on 0800 652 4878 to find out how we can help you.